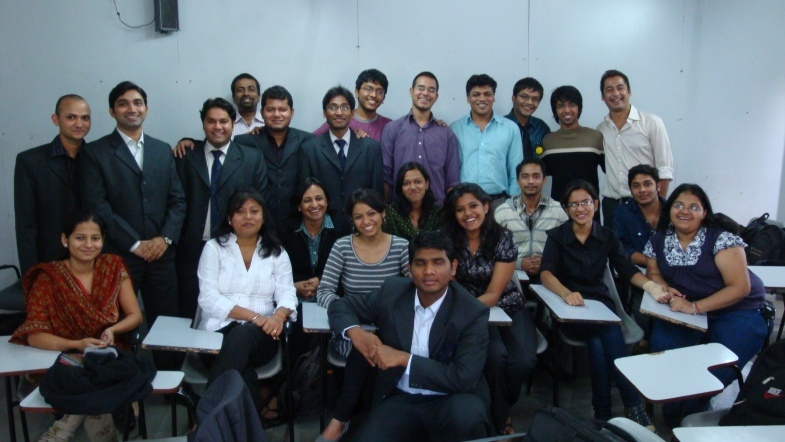 Presenting below the pictures of successive MBA batches an attempt to capture the nostalgia of days gone by. 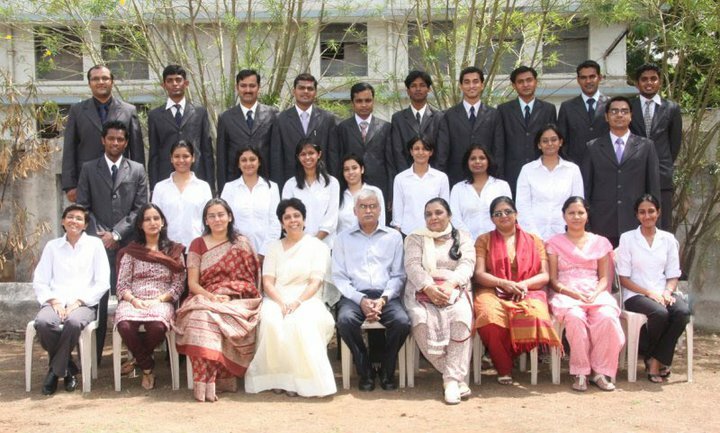 Tasmac Pune groups followed by Asian School of Management and Symbiosis Centre of Management and Human Resource Development (scmhrd). In the group below is my dearest friend & colleague the Late Captain Himmat Adisare (sitting 5th from left) a winner of the Sword of Honour in the Academy. I remember fondly his keen sense of humor and inspiring courage. Disregarding pain he took classes with a smile till his last week. A brilliant tutor in Marketing whose favorite subject was branding. May his soul rest in peace. Tasmac Class June 2010 brimming with talent! Oh this class was full of energy and excitement. The class environment studious but always laced with spontaneous humor. I wish each one best of luck in their future. Ekta, Shreya, Pooyan, Ketaki, Sayyed, Binita, Sandeep, Pratima, Jagdeep, Smita, Gaurav & Kashif. Sitting in front – Fareez our awesome class coordinator. 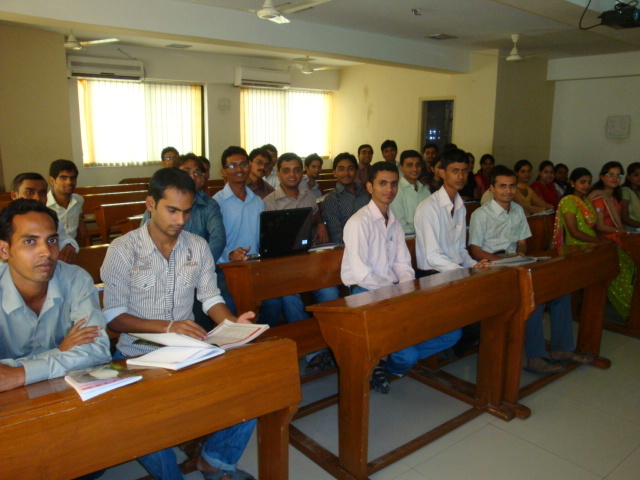 This batch of HR specialization passes out in May 2012. 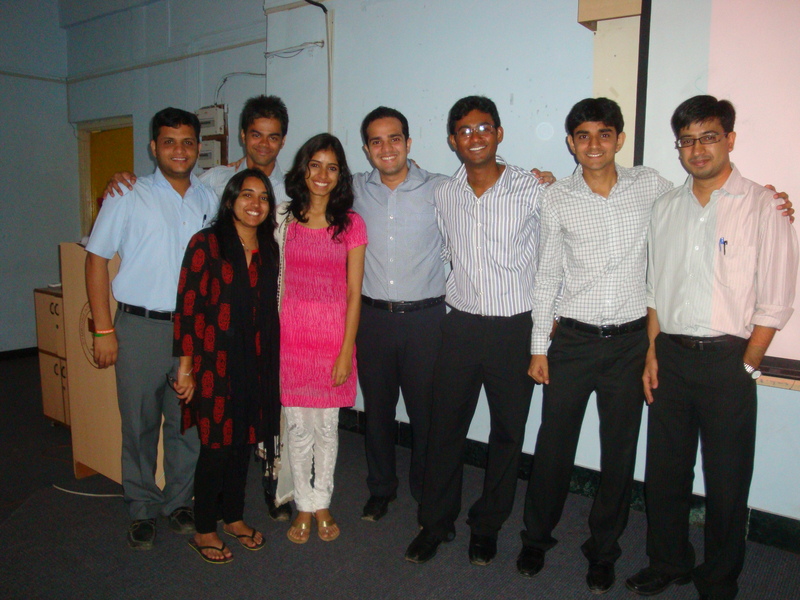 They were a keen group and I wish them an exciting career in HR as strategic player. All the best to you Shraddha, Rashmi,Vinita, Apara & Jennie. I am sure you will be an asset to your organizations. In the pictures below you can almost feel the energy and the hunger to learn in the young folks at the Asian School of Management (ASOM). 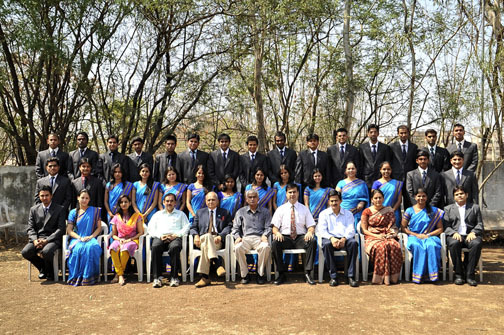 These cheerful, bright learners come from all all parts of the country, Madhya Pradesh, Maharashtra, Orrisa. UP, Bihar, Jharkand, Delhi, Mumbai, Punjab, West Bengal and Assam and represent the spirit of national integration. They are all set to make a difference in the world. 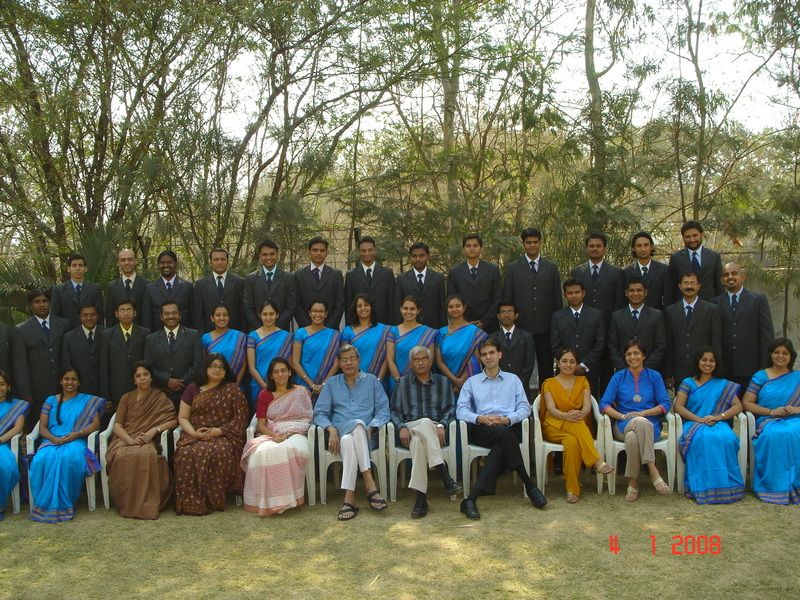 Symbiosis management institutes in Pune and elsewhere in India are highly reputed for excellence in Management education. SCMHRD is easily a star among the others. A group of the 2012 -2013 batch gave their presentation and we took some photographs for remembrance sake. 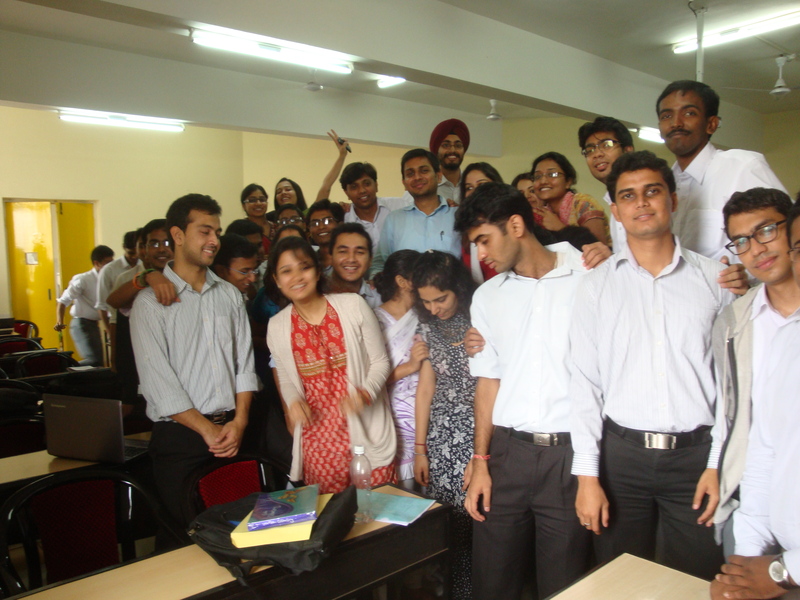 And some candid pictures of the SCMHRD taken to capture the spontaneity of the moment. Cheers and wish you all the best! Can somebody please give some details of Himmat Adisare. His classmates from the 1966 batch (50 years ago) at school are trying to get the information to include in a Souvenir to be brought out soon. How did he pass away? What ailment? Any information to contact any of the family members will be welcome. Thanking you all in advance and Best wishes. Hi George I tried to find out Late Himmats family contacts from a common acquaintance. The numbers received are not valid any more. But I wonder if his family still lives in their earlier residence Address sent to me. If required I could email it to you. Hello Uncle, this is Vidula (Capt. Himmat Adisare’s daughter). Thank you very much for posting this article about my father. My email address is vidula.a@gmail.com just in case you need it for further communication. P. S: Mom and I are staying in Mumbai. Our pune house is locked. It’s so good to hear from you and to know that you and your mom are living in Mumbai. I remember vividly how fondly your dad always spoke of you. I will write on your email id separately and give my contact details too. Please convey my regards to your mom. Hello uncle, this is Vidula (Himmat Adisare’s daughter). You could mail me at vidula.a@gmail.com or give me your email address for us to get in touch with you. My mother and I live in Mumbai. Thanks for trying to get in touch with us. Hope to hear from you soon. Me too) You are melcome) Best Regards! I am always delighted to hear from you. You are a wonderful person. With happy tidings to you and your family. Thank you for sharing these wonderful photo’s I would love to be able to share in some of your learning in Symbiosis Management.. Seeing how all things interact as one thing relies upon another so to speak.. How is your farm going? I am sure to have missed a post.. And would be grateful if you have posted to forward me a link.. as I have over 900 emails still awaiting viewing from updates of WP posts.. :-)… Thank you for you welcome visit Dilip.. I hope the rains have been good and not flooded as I know many have experienced large downpours which have caused floods in many parts around your corner of the world..
Sue knowing of how you are so busy in uplifting the many and spreading joy that your being here means so much to me. God has blessed us with rains in abundance and the herbs are doing great though I am in the US these days. Will continue reading your beautiful posts regularly. Thank you sir for the nice photographs of our class with our most favorite teacher who has been our guide. 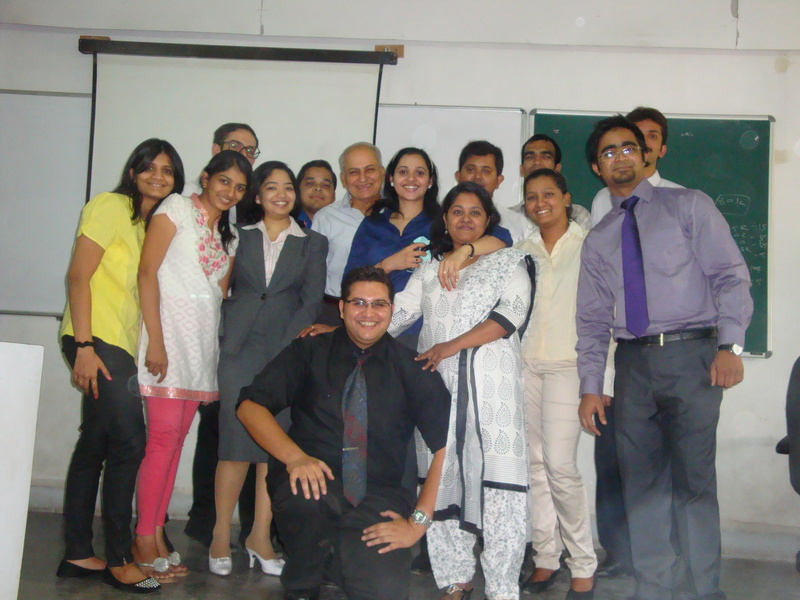 Yes Girish these are my most treasured moments being with my dear student friends. i am a novice in the world of Blogging, maybe I’ll learn a lot of you who are more experienced in the world of bloggers. Greetings to you dear friend. I am 3 years into blogging yet I consider myself a learner. I truly enjoyed you blog and was much inspired. Dear Subhan I am delighted to read your comments. With all my good wishes for your grand success in your graduation. 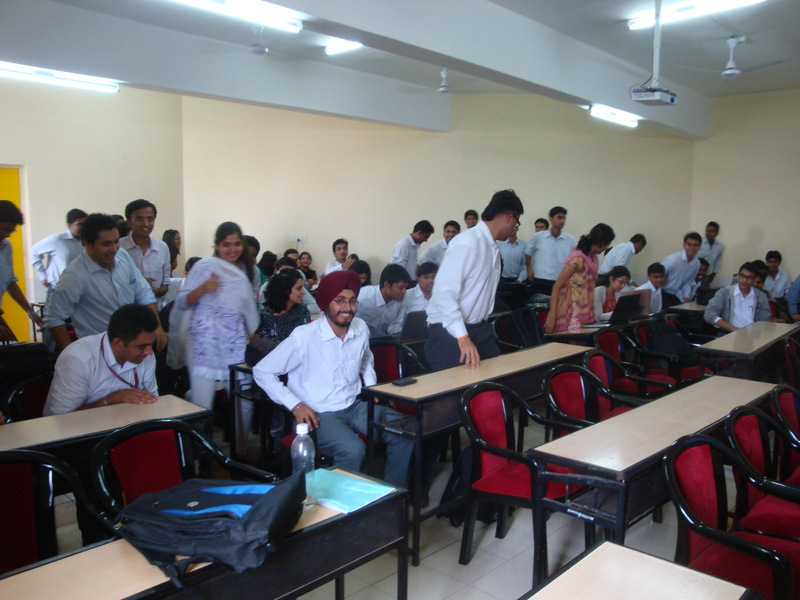 Hi Dilip Sir and hello to all our forthcoming batchmates. 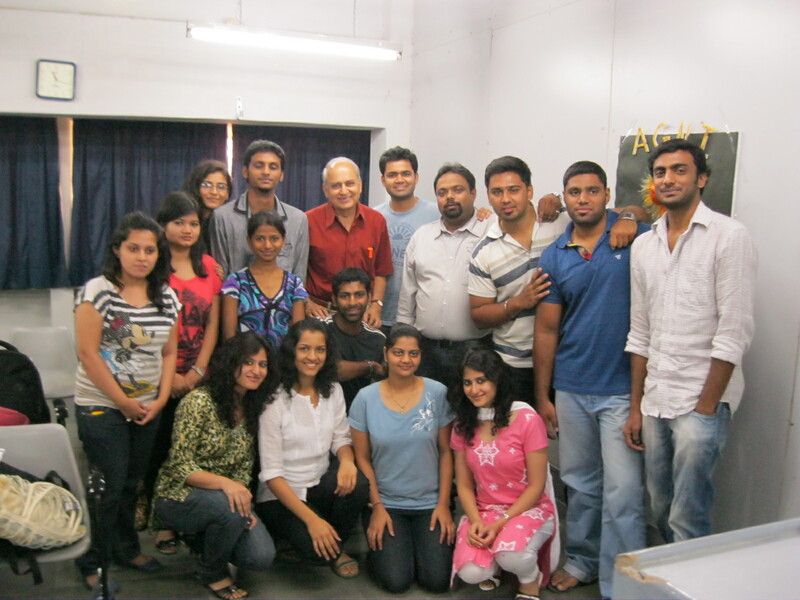 I miss being in your classes sir and miss you keetki, and all other college mates. All of us together have shared a energy and new vision to life which we carry forward when we start moving on our own paths. 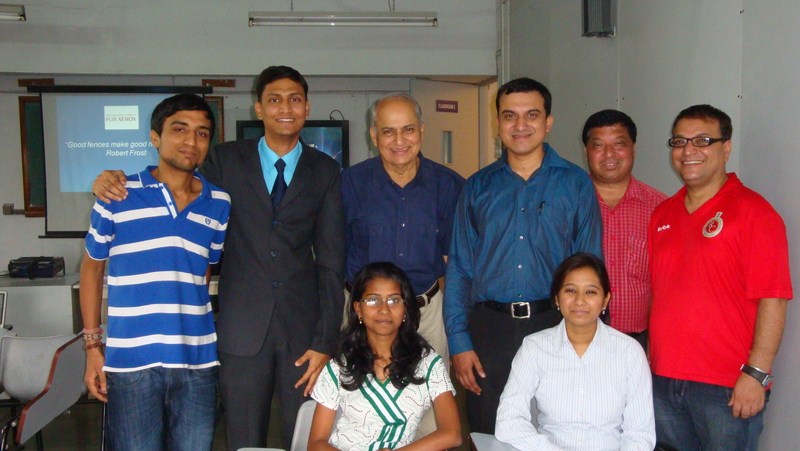 A desire to achieve and positive attitude also needs to be learned from Dilip Sir apart from the regular modules. All the best to the new batch. A visit from an awesome traveler, photographer and a talented blogger like you means a lot to me. Yeah my blog does meander around and I seem to be enjoying it. Thanks pal and lets be in touch. Thanks Bhaven. Nice of you – I surely will. Cheers! These photos actually depict the Tradition of TASMAC and looking at the pictures of all students and Professors and staff , i can imagine how it has grown over a period of time . Gracious of you to visit! Never mind the HR n Leadership 🙂 Your compliment means a lot! And for you too all the best! Hey Agam its so nice of you to drop by. Yes it’s a honor to have a creative person like you as a friend. Warm regards and do come again. A warm welcome to you! Yes I am blessed to have the company of young folk. They are so spontaneous and fun. I felt nice visiting and reading your blog and I am truly inspired by your talent. I wish you a wonderful journey ahead – you be awesome n be happy! Hi! Sir. 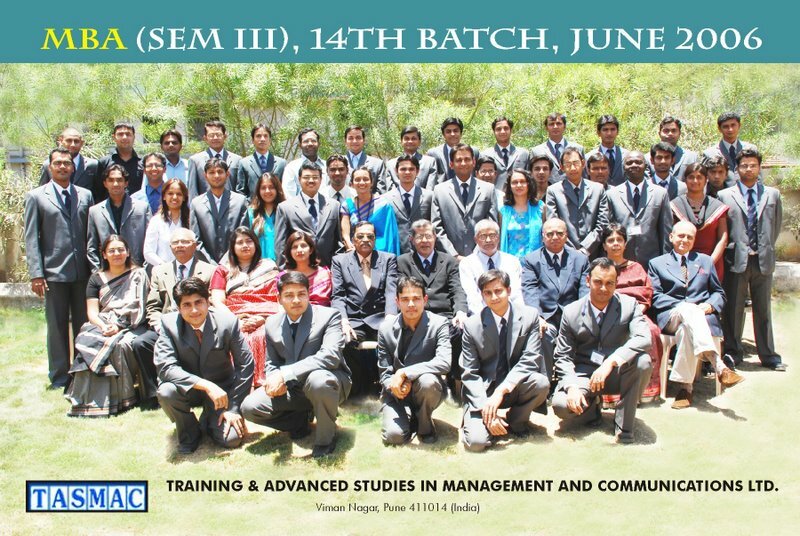 It was always great time to attend your 2011 Batch SM (Strategic Management) class. As Richard Branson says “A business has to be involving, it has to be fun, and it has to exercise your creative instincts.” Our class was full of fun & entertainment with sharing knowledge. I really appreciate the efforts you put to motivate each of us and provide a stand to learn life lessons along with syllabus. I can never forget your teaching “Be Joyous always”. 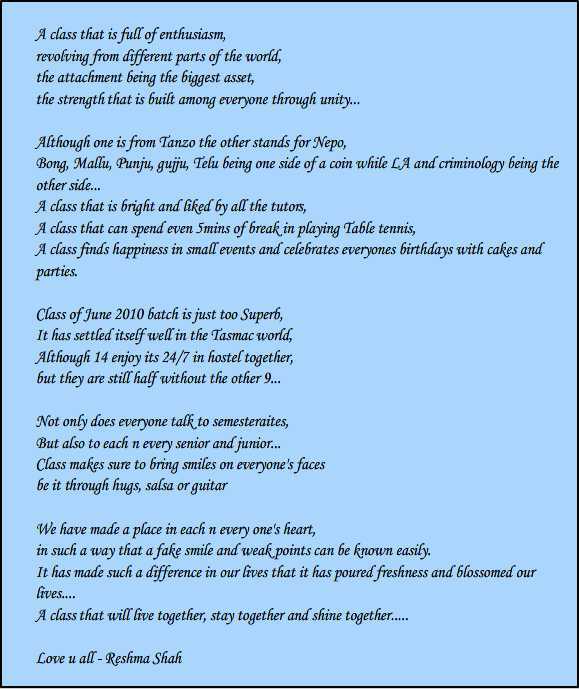 Thanks a lot for keeping us & our class vibrant. So thoughtful of you to post pictures of your hometown. Yes I do have fond memories of Balurghat as a quaint and peaceful town. Thanks my dear friend and do keep in touch. BTW as I am not on Facebook I am unable to access the other pictures. Hope you have them on your blog too. Heartiest congrats. I am delighted to know of your success in Strategic Management. This is a singular achievement – anyone who can grasp strategy can contribute significantly both at the corporate level and at the functional levels. You are now well-set for an exciting professional journey ahead. A blog is the best forum and your achievement will inspire our other readers too? Thank you for sharing your success – it means a lot! At the onset would like to apologize for using this forum to write to you about a personal cause but still taking the liberty to do so. I received a certificate of merit for topping campuses in strategic management today and I could not partake of the joy without thanking you for the same. Thank you immensely for introducing strategic management to me in such a wonderful way ! Thank you Sir once again for everything ! I am truly happy as this gives me a sense of tremendous courage to face the future hurdles and you have inspired me to achieve by constantly encouraging me and pushing me to do better !! Thank you …. i’ve visited your blog. I liked it very much. I’ll try to visit this blog regularly. I am honored by you visit to this blog. I extend a warm welcome to you. I appreciate your sentiments with deep humility. It is young people like you who inspire me and I do strongly believe that I am one of you. I have very good memories of Poona Business School as I used to be a visiting faculty there some years ago. They are good people there. Maybe I will say a hello to them one of these days. Please do let me know if I can be of help any time. I also wish you a great future and happiness. This is Nayan prakash gandhi basically from jhalawar (Distt.Rajasthan ). I have completion my MBA + PGPM from poona school of business pune ,katraj . i am very happy to see your profile on linked in. infactly you are multiskilled well qualified and experienceful proffessional. in a short and consice way only one word i would like to say about u that you are a replica of god becaz in such a manner you have served to yourself as per honesty in each working segmentation . so hope that your bless will alwaz with us towards good actionable work. Just a quick note to say thanks for the link to my site – http://www.india-insights.co.uk – from yours. Good luck with your venture, and please let me know if I can help in anyway. It is my turn to say thank you. I found it particularly useful in analyzing a case on Marks & Spencer. I am sure your web site will prove a good learning resource for my students on how MNC view emerging and Indian markets. Gr8 to see your blog growing exponentially. (16,871 hits) —- WOW ……. Congo. You have always depicted ideologies a bit different & philanthrophic in front of the world. It was amazing to note the complete portfolio of simple, sobre, calm, active, disciplined, distinctive, inspirational, knowledgeable, understanding & empathetic human being. Oh Sohan I am touched by your sentiments! I am thrilled that after 2006 it is in 2010 you viewed your group photo occupying a pride of place in our blog! It is you guys who have given me a purpose! I am savoring all the fun in the company of you young folk. Wish you great success and days full of joy ahead! your asked. Still I have tried to give my view. interested areas like interacting with people, traveling, to know about others, etc, Though I was pursuing PGDBA , we were bound to take combined trades i.e. Marketing + Finance. Always choose specialization where you will get pleasure practically on job.There is no relation with what you have studied in basic degree. This is an era of Knowledge management and in Pune we have a knowledge park. Sir these days I am concentrating on getting a job. I have faith and believe to get job early. Because I am trying, trying and trying. If I want anything by heart and mind the God will help me. Its a long time yet I feel the memories of our association in ASOM are still fresh. Because whenever I feel alone I remember some of the incidents and moments in our class. This blog I notice now has a lot more stuff for my learning and for updating knowledge. It’s so nice to hear from you. Yes it has been quite sometime now. I am sure you must have lined up a good company placement. Please do visit our blog and remain connected. Do also share your work experience. Wish you great success in your professional career. 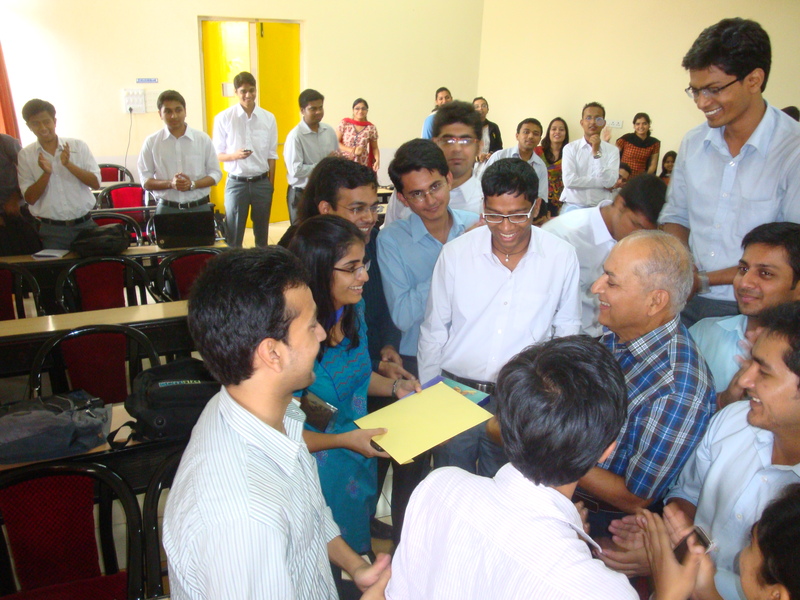 I will quote last words of my guru Mr. J.R.Kamat, (x-Manager, TSDC, SIEMENS) in his farewell speech. The purpose of this blog,facilitating a powerful and dynamic learning tool is sure to flourish & built collective knowledge. Nice of you to share Mr Kamat’s thoughts on ‘continuous learning’. It captures the essence of my blogs theme so well. This snap of course shows “the energy and hunger for learning” but its value can only be recognised by a true visionary “This we call as a great Goldsmith” since, true value of a gem can only be well valued by a good goldsmith; we are the uncut stones of ASOM, and capable of becoming “gems” if a good “goldsmith” like Dilip Sir continues giving us a finishing touch with the learning of values and ethics. Ved …. your comments make me feel truly humble. I am aware how keen and full of energy you wonderful guys are … getting ready for the final take-off and into the corporate world. Well armed with a strong sense of values to make a difference to the society. Thank you indeed. After reading the sentence you mentioned sir i am really to start my Life’s First time corporate experience for which i am into preparation from TASMAC ……those wordings made me more focused.